“There is no contemporary art in Uganda”, remarked independent curator Simon Njami two years ago when he visited Uganda. The outrageous remark stirred up a storm on the Kampala art scene which the perpetrator has ignited at this year’s Kampala Biennale. Seemingly to assert his earlier claim, Njami, the curator of the third edition of the event has invited seven established renowned international artists to set up their studios in Kampala to tutor young artists, to introduce ‘contemporary’ art to Kampala. The (self-proclaimed) librettist looks at the event as a classical music piece with him as the conductor and composer, the seven invited artists as the masters and the young artists as apprentices. The seven masters include Abdoulaye Konate, Bili Bidjocka, Godfried Donkor, Myriam Mihindou, Radenko Milak, Aidah Muluneh and Pascale Marthine Tayou. The fact that there is no Ugandan artist on the master’s line up radiates the allegation that there is no artist in Uganda worthy of transmitting substantial knowledge to the younger generation. So this is where and how the curator stands to start a contentious but a would-be fruitful debate. Visibility is important if not the most important aspect for an artist who wants to ‘stay alive’ when they are dead. This is one of the key points the veteran curator is trying to put across and one that needs the attentive ears of the Ugandan artist. If the world doesn’t know you, if your neighbour doesn’t know that you can paint better than Leonardo Da Vinci, then you actually can’t paint better than him. Inside ‘The Library’ an installation by Bili Bidjocka’s studio team. There are certainly Ugandan artists producing noteworthy work. Sanaa Gateja’s work can fall in the same category as El Anatsui’s or Abdoulaye Konate’s. Xenson’s avant-garde style and craftsmanship would fit well into the Zeitz MOCCA. Francis Nnaggenda, an artist from the older generation, did a commission for the Rockefeller Foundation. “But no one knows these people”, Njami will tell you. Whereas Uganda is blessed with the Margaret Trowell School of Industrial and Fine Art which has churned out artists for the last 70 years, it has not made ‘masters’. The curator says Uganda’s creatives have not made a mark on big international stages compared to the masters he has invited. Certainly, there is no Ugandan artist you can name who’s been to Documenta, the Venice Biennale or even the Dakar Biennale. This can be attributed to so many reasons, one of which could be the political history of the country which is filled with civil wars and power struggles. Nevertheless, the art scene is growing with a few Ugandan artists like Stacey Gillian Abe and Waswad making a mark internationally. What has been happening on the scene is not to the magnitude of what Njami might be accustomed to but it is worth acknowledging. Festivals like Laba! and KlaArt have garnered local artists to craft novelty, provoke and ask questions with their creations. 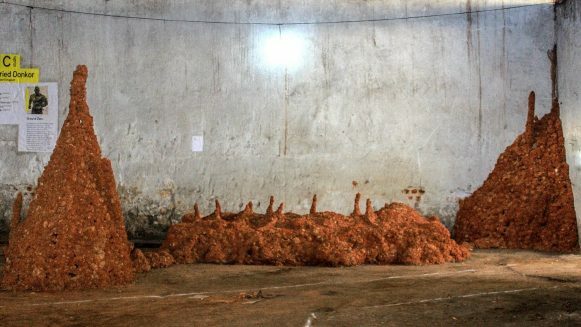 A view of both Sandra Suubi’s (left) and Astrid Mourik de Wit’s (right) installations at the Biennale. “Through this third edition of the Kampala Biennale, our aim is to revitalize ancient practices that are more than needed in our contemporary world. Practices that would bring back notions like transmission and togetherness”. Six of the masters invited are of African descent and only Radenko Milak is from Bosnia. At least here, the curator tries to save the struggling scene from another brand of western imperialism. But still, it lingers around the whole show, from it’s poster which has a doctored image of Gustav Courbet’s The Painter’s Studio to the dual citizenship of most of the masters who have a strong attachment to the western world. The curator himself is Swiss! Each master set up a ten day intensive studio programme from June till August with each averagely having five apprentices. Setting itself apart from other Biennales; the curator chose to put the event in one venue, an abandoned warehouse in the industrial part of the city. 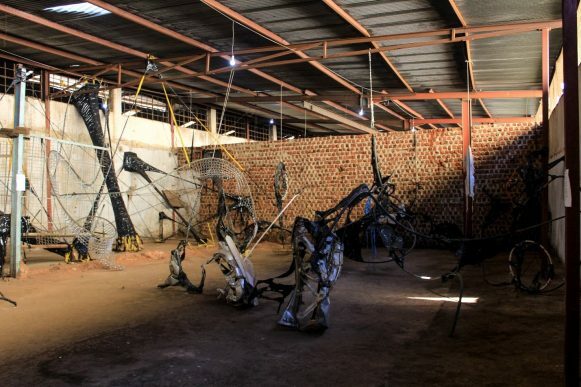 Whereas warehouses are not new to the contemporary art world, going back to the iconic Freeze show by the YBAs that ushered in the trend, it is news in Ugandan art. The venue was also very crucial in opening up the minds of the young creatives and jump out of the conventions of white walls, canvas and paint as we shall see. I was selected to participate in Abdoulaye Konaté’s studio which I shared with Leonard Opondo and Rebecca Bulimo from Kenya. I had just learned about the master a few months before applying and felt privileged to be sharing knowledge with someone of his caliber. I didn’t expect language would be such a barrier in our studio as Konate is from the Francophone part of the continent. An interpreter had to bridge that gap. We were introduced to weaving, a craft that can be traced in almost all major civilisations. Using fabrics, Konaté showed us how you can ‘paint’ with it. Simplicity was key in our workshop where we had to forget our ‘sophisticated’ themes and interests. This led me to explore African geometry in my work. Simple patterns and colourful shapes that appear traditionally on mats, the traditional Ghanaian Kente cloth, jewelry, the Ndebele house paintings and cave drawings intrigued me mostly because of their aesthetic appeal and overall similarity. 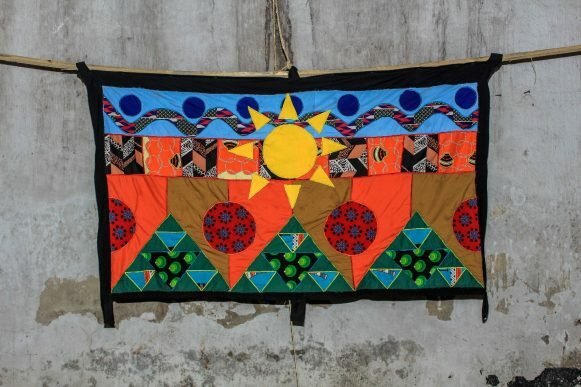 Geometry is at the center of African art and craft with triangles and design components like fractals very vital. Matt Kayem’s tapestry from Abdoulaye Konate’s studio. Bili Bidjocka worked with Alexandra Kuznetsova, Rafiy Okefolahan, Nicole Remus, and Gloria Nalwoga. With assistance from Simon Njami, they erected a spiral library out of wooden poles and papyrus. Its blueprints were prepared by Doreen Adengo, a Ugandan architect and an alumna of Yale. Titled ‘The Library’, the installation was one of the tongue-dropping works at the Biennale as it captured the experience and nature of the sacred place in a thought provokingly visual manner. Inside it, there were random objects thrown, carefully arranged or hang around the papyrus walls. From mirrors, to video screens, phone chargers, a dresser, name it. Godfried Donkor’s studio had Wamala Joseph, Adrian Migadde, Allan Kyakonye, Gilbert Musinguzi and Brian Magala Kiwanuka who were all Ugandans. The Ghanaian British, who works mostly in collage, interestingly allowed some of his apprentices to work with three-dimensional installations. Brian Magala Kiwanuka produced a paper installation about traffic congestion in Kampala while Gilbert Musinguzi re-created the anthill inspired by the social creatures’ persistent nature to build their homes when destructed. Allan Kyakonye’s ‘Egg portraits’ of Kabaka Mwanga and Muteesa I also attracted a lot of admirers at the opening. About three meters high, they comprised of powdered pigment on aluminum foil with egg tempera used to paint the faces. Two interesting personalities, the son vilified by religious fanatics for murdering the Uganda martyrs who followed a path that was set by his father who invited the missionaries to teach western ways to the Baganda. Myriam Mihindou’s performance was a bewildering one at the opening of the event. Assisted by Andrew Arim from Uganda, Volaine Le Fur from France, Lais Catalano from Brazil and Pierre Manau from Congo they gyrated, convulsed, made noises and moved around the hall to the awe of visitors. In this studio, they explored freedom and control versus the body, mind and soul in two video performances and the live performance at the opening. Ocom Adonias’s charcoal and wash drawings on the walls were an interpretation of the cold hand of slavery. The studio headed by animator, Radenko Milak from Bosnia also had Bogere Gilbert and Odur Ronald as apprentices. Blending analog and digital approaches, Radenko and Ocom also collaborated on an animation film. The young artist who usually works in the traditional painting and drawing got introduced to a unique technique which combines stop motion with frame by frame. “Dreaming of Prey to Grasp Shadow” was the film they created which wit fully and metaphorically touches on the odysseys of African migrants who risk their lives to cross oceans to European coasts. They employed the innocence of children and their games to give it a playful edge. Aidah Muluneh’s studio included apprentice Noor Okulo whose triptych photographs were impressive capturing grace, beauty and vulnerability. His colleagues were Julius Ssekidde, Jake Singer and Miora Rajaonary. 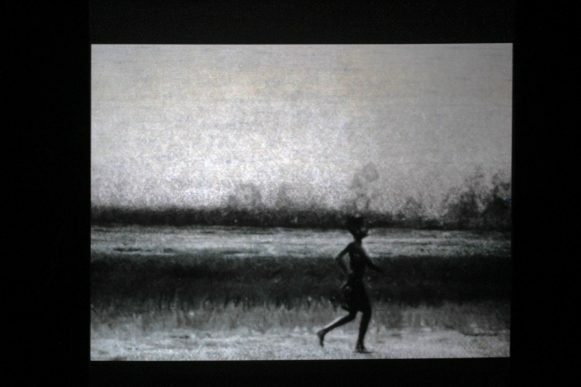 A still from the animation video, Dreaming of Prey To Grasp Shadow, a collaboration between Ocom Adonias and Radenko Milak. Part of Ocom Adonias’ wall drawing, Doors of No Return. 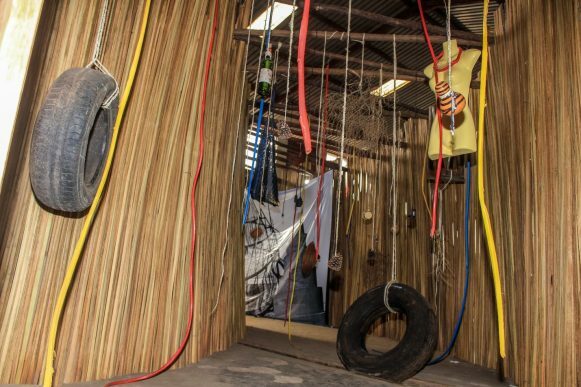 Pascale Marthine Tayou’s studio had the apprentices draw inspiration from Disney’s Queen of Katwe. 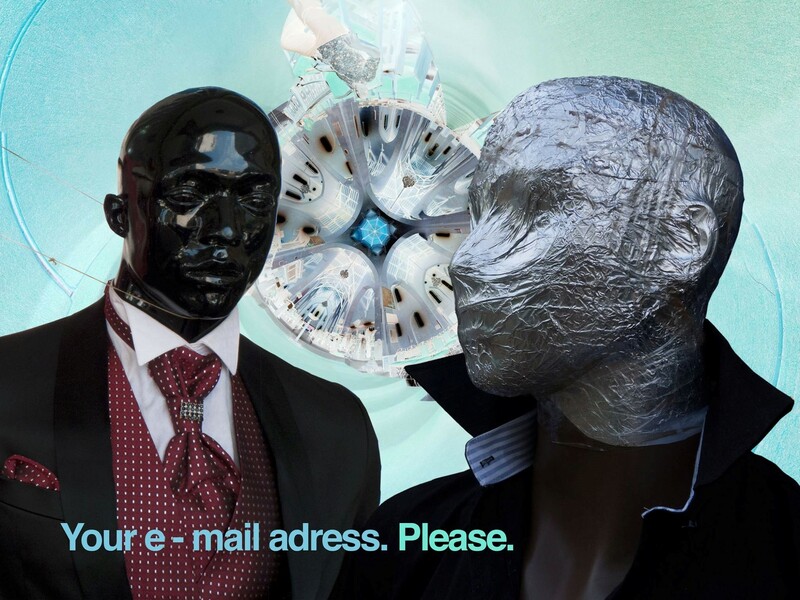 Sandra Suubi questions whether our aspirations and possible ways to a better future also become the webs that hold us back in her installation, ‘Ebirooto IV’. John Baptist Sekubulwa evokes the spirits of Pan-Africanism with his ‘Kings and Queens Are Made In Kampala (Africa)’. He hints on the immigration habits of young Africans to the greener West while in fact the motherland produces royalty. Other artists in the studio include Kaloki Nyamai from Kenya, Astrid Mourik de Wit from the Netherlands, Delphine Buysse from Belgium, Beya Gilla Gacha from France and Doddridge Busingye from Uganda. A friend of mine who has worked as a curator in Belgium found the Biennale more interesting than the last Documenta! Apart from a few flaws, this is a show everyone should have seen, especially the average Ugandan who’s only known reference to art are ‘elephants-in-the-savanna’ paintings. And the question would be, ‘did the transmission of knowledge take place?’ As an artist on the project, I got my eyes opened to new ways of thinking and working, which most of my peers can also attest to. Practices like video art and performance barely have a presence on the Kampala art scene and at this show, there were well presented, most essentially by experienced practitioners. The fact that there was no painting at this show also encrypted the statement, ‘this is what the international art world expects of you’ on the minds of the young artists. We have important knowledge on the continent that should not disappear ‘six feet under’ with the older generation. The new Biennale concept created a new platform, which is vital especially now that we are being engulfed by the global trend of solitariness. Two more Biennales down the road with the same setting, the much needed change may be accomplished and we will be seeing more Ugandan art at big international stages as well as achieving its’ goal to build a strong contemporary art scene. 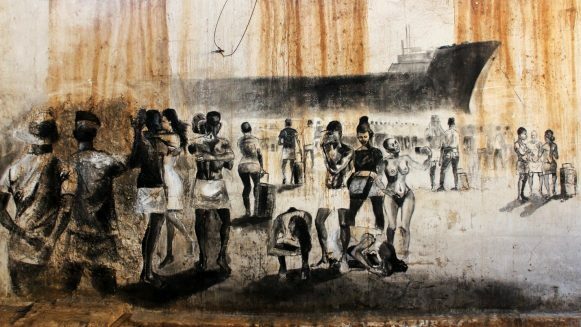 Matt Kayem is a contemporary artist, writer and art critic working and living in Kampala, Uganda. He was apprentice in KAB18 as well as a participant in the Critical Art Writing workshop that was part of the KAB18 educational programme supported by the East Africa Arts Programme of the British Council.